Deep, narrow surveys with space-borne telescopes have identified new populations of high-redshift galaxies at redshifts z > 5 through photometric dropout techniques. While these observational efforts have revolutionized our view of the high-redshift Universe, the small fields of such surveys severely limit their constraining power for understanding the bright end of the high-redshift galaxy luminosity function and for identifying other rare objects, including the most massive, oldest, and dustiest galaxies at each epoch. By combining the power of multi-band photometry for dropout selection and the unprecedented combination of wide area and deep imaging, LSST will uncover the rarest high-redshift galaxies. The discovery and characterization of the most massive galaxies at high redshift will provide new constraints on early hierarchical structure formation and will reveal the galaxy formation process associated with high-redshift quasars. Observations of i-dropout and z-dropout galaxies in the Hubble Ultra Deep and GOODS fields have enabled a determination of the rest-UV luminosity function of z 6 galaxies (e.g., Dickinson et al. 2004; Bunker et al. 2004; Yan & Windhorst 2004; Malhotra et al. 2005; Yan et al. 2006; Bouwens et al. 2004, 2006). There is a scatter of 1-2 orders of magnitude in determinations of the bright end of the LF. 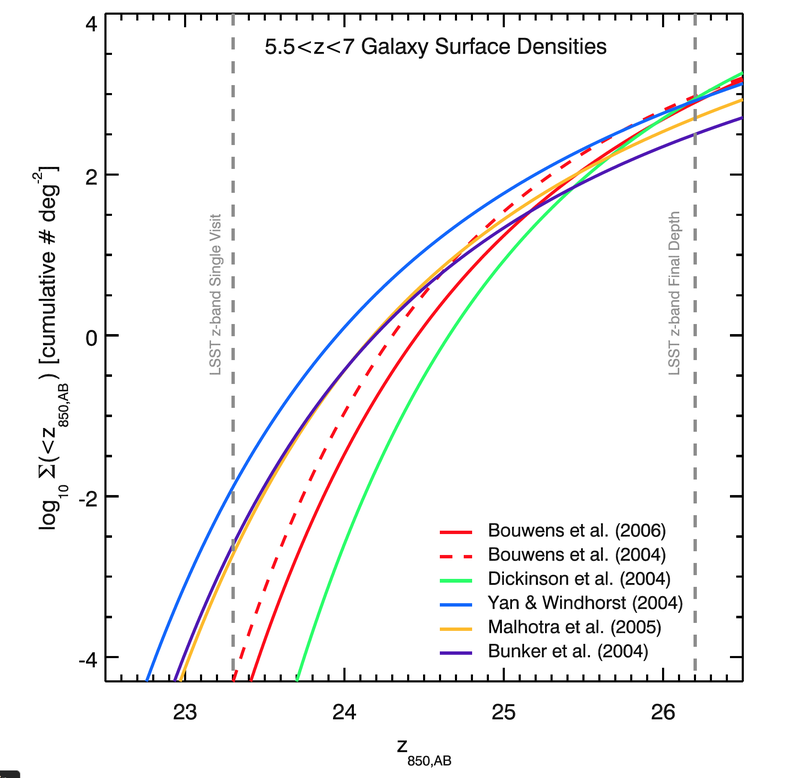 The attached figure shows the galaxy source count surface densities for 5.5 < z < 7 galaxies in the z-band calculated from a range of z 6 rest-frame UV luminosity functions taken from the literature. LSST will increase the counts of galaxy candidates at z > 5.5 by 5 ordersof magnitude. The LSST survey will probe almost the entire luminosity range in this figure and should find hundreds of z850 23 − 24 galaxies at z 6. The resulting uncertainty on their abundance will be a few percent, 2–3 orders of magnitude better than currently available. Observatories such as JWST will reach extremely deep sensitivities, but it cannot survey large areas of sky; for example, the Deep Wide Survey discussed in Gardner et al. (2006) will be only 100 arcmin2. For extremely rare objects such as luminous high-redshift galaxies, JWST will rely on wide-area survey telescopes such as LSST for follow-up observations. Wide-area surveys of the far infrared, submillimeter, and millimeter sky may also be capable of finding rare, massive galaxies at high-redshift through dust emission powered by star formation or AGN activity.